The Low Down: Small towns, small minds; isn’t that how the saying goes? Enniston, Maine’s population has made a complete 180 from being in “the coldest, whitest state in America” to one that is playing host to a large influx of Somali Muslims escaping personal and political strife in Africa. Tom Bouchard feels badly for the kids that are dumped in his high school, speaking no English and having to navigate the hallways, classrooms, simmering acrimony and a town that would prefer they disappear altogether. Saeed shows up to class one day wearing a Manchester United football jersey, and Tom finds out that Saeed has played soccer all his life. Inviting him to come and check out the soccer team, soon there are new Somali players on the team. Fortunately, most of the players are thinking more about beating their arch-rival, Maquoit High School, than the change in make-up of their team. Saeed and the other Somalis take the Chamberlain High School team to unheard of new heights. Dizzying, post-season heights. But something is bubbling beneath the surface in just about everyone in town. For Tom, it’s his hatred for Marquoit and their rich-kid ways; for the mayor of Enniston, it’s the changing makeup of the town’s population. Both act on their impulses, with Tom having to do community service and the mayor having to now defend her town and townspeople from the threat of “help” by a group of white supremacists. Then another impromptu action causes pain in the very family that Tom wants to help. Can someone ever truly understand the “why” of other cultures? Best Thang ‘Bout It: The subject matter is superb and is presented in a sensitive way. I have yet to read another Young Adult book concerned with the plight of refugees and what happens on a local level when there’s a wave of immigrants into a community, so this is a very refreshing and timely topic. It’s hard on both sides. And particularly today, when there’s a fear of Islam, it makes for an uneasy mixture. This story does a good job of not only describing the hopes and fears of the immigrants, but also the cultural ways and differences that are more than likely the reason the locals can be fearful and resentful. I’m Cranky Because: Though the story was good and there were many dramatic conflicts, nothing felt surprising. The narrative stayed pretty much in the middle, excitement-wise, and many of the struggles and action were telegraphed in advance. The characters felt like players throughout the story instead of becoming people that I cared about, making it feel a bit clinical. The Bottom Line: This book is a solid read with very helpful and insightful look at immigrants generally and Muslims in particular. Don’t think that it will feel like a lecture, because it certainly doesn’t come across that way. There’s plenty of goings-on to keep the reader interested. 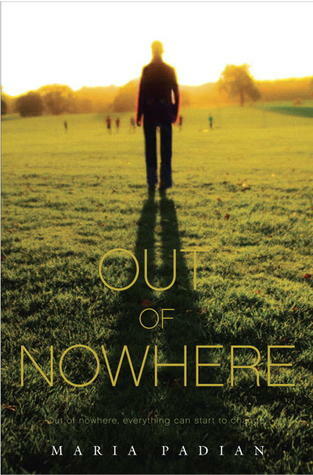 Out of Nowhere by Maria Padian was published today by Knopf Books for Young Readers. A free copy of this book was given to Ink and Page in return for an honest review. Big thanks to NetGalley and the Publisher.